Right now you can get this Step2 Sit and Play Kids Picnic Table With Umbrella for ONLY $38.99 (Retail $49.99)! 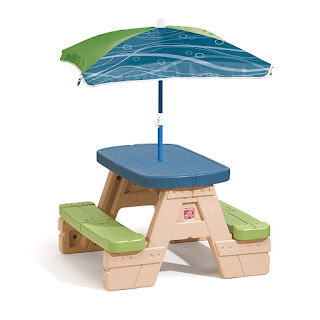 The Sit and Play Picnic Table with Umbrella is durable and compact kids picnic table for your toddlers and preschoolers. This junior picnic table can be used both outside on the deck or inside during a rainy day for a tea party. This toddler picnic table can help your little ones develop their social skills as they use the table as a place for eating or a place to create crafts together. There are plenty of ways for your children to use this sturdy kid's plastic picnic table!